WASHINGTON – Unemployment hit 3.8 percent in May, the lowest level in 18 years and a jobless rate that economists say represents virtually full employment. While that’s good news for workers, it’s causing problems for businesses that say they can’t get American workers to fill open jobs and they can’t get permission to hire foreign workers who will. “We’ve tried everything,” said Harry Phillips, owner of Russell Hall Seafood Co. on Hooper’s Island, Maryland. “We’ve had job fairs, we advertised in the paper, we’ve done everything possible to hire American workers, but they haven’t come. “We’re not going to be able to keep operating. We can’t keep going the way we are right now,” Phillips said recently. Phillips is not alone. The Department of Labor said about 5,600 businesses applied this year for more than 142,000 visas under the H-2B program, a temporary guest worker program that lets foreign nationals fill positions of need in non-agricultural industries for up to 10 months at a time. But Congress has capped the program at 66,000 H-2B visas a year, a number unchanged since 1992 even though the U.S. population has grown by nearly 70 million in that time. With more than twice as many requests as visas, winners are selected every year through a lottery – and businesses that don’t win the lottery can find themselves in a bind. “We’re going behind a little every week, just hoping and praying we get our visas to bring these workers here,” said Phillips, whose company did not get the allocation of visas it requested. It’s not a problem that’s limited to the Eastern Shore of Maryland. Arizona was 10th-largest user of H-2B visas in 2017, in large part due to the high demands of the landscaping industry. 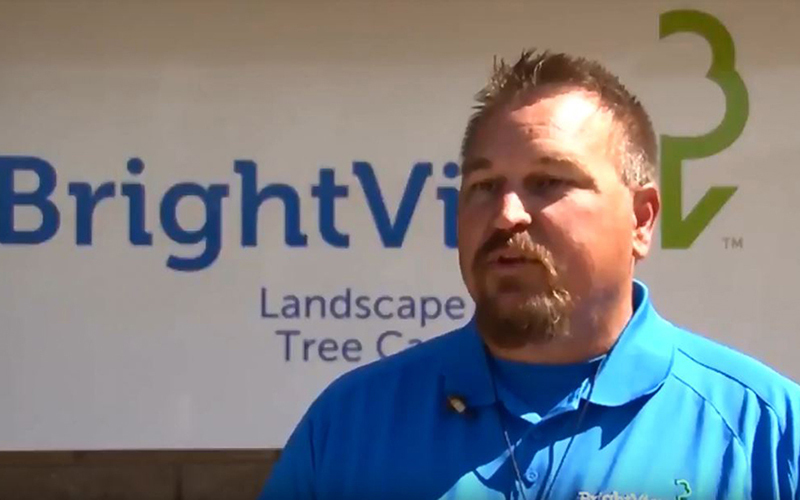 BrightView Landscape in Phoenix is one of many in the state that relies on H-2B workers to fill out its crews. BrightView got its visa allotment this year, but branch manager Jon Berg says that without the foreign workers, he would be unable to meet contracts, which would in turn affect Americans workers on the payroll. Whether they are winners or losers in the visa lottery, hiring foreign workers is not the first choice for participating businesses. All said they would prefer to hire American workers – but they often can’t get any to apply. 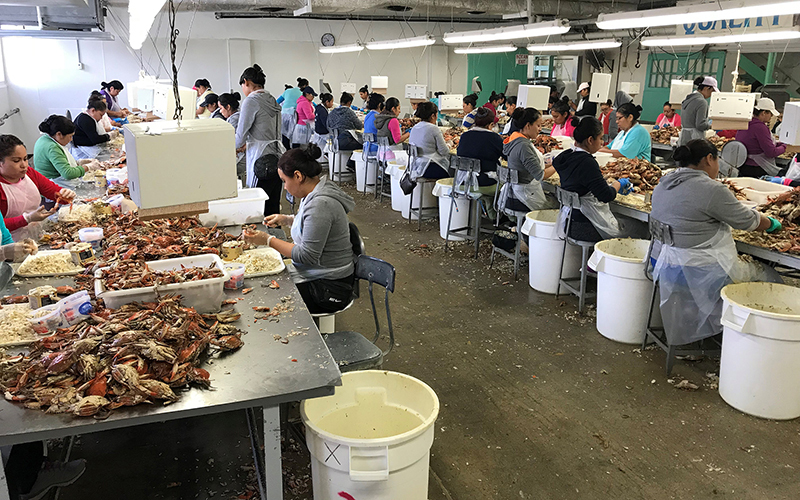 Picking crab meat from the shell is an arduous process that must be done by hand and takes a small army of employees to work through the day’s catch. 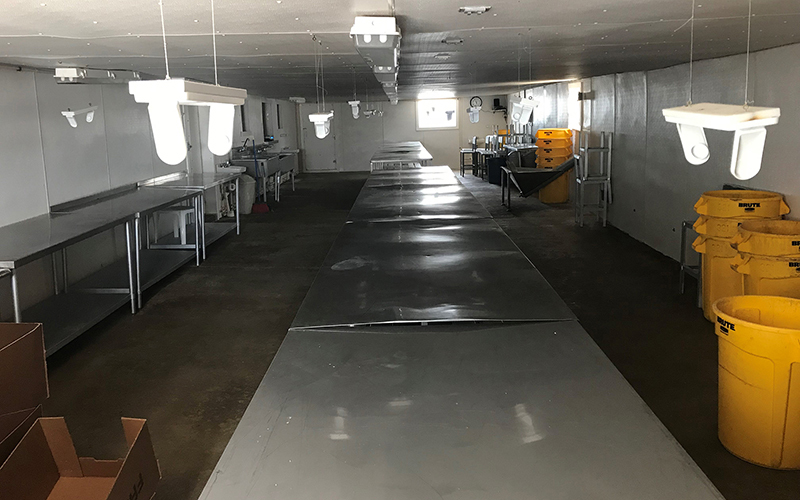 Like most crab houses on the Eastern Shore, Phillips pays a base salary well above minimum wage and offers hourly incentives, but he still can’t attract local workers. Jack Brooks, a managing partner at J.M. Clayton Seafood Co. in Cambridge, Maryland, said he has tried hard to recruit from the surrounding area. “We won an award from the governor of Maryland for a program we ran to try and hire young people,” Brooks said. “We asked for 50 high-schoolers to come work in the summer. Zero showed up. Hiring temporary workers isn’t easy for American businesses. The process is expensive, intentionally complicated to protect American jobs, and it recently has been overwhelmed by the number of businesses seeking help. The first step in getting an H-2B worker is to get clearance from the Labor Department’s Office of Foreign Labor Certification, which requires businesses to undergo a multistep process to certify need, ensure that American workers get the first crack at jobs, and guarantee wages that will not undercut the market. As that’s going on, prospective workers are undergoing background checks at the U.S. consulate in their home countries. Once a business is certified, its request is sent to the Department of Homeland Security, which holds the lottery and hands out the visas. Congress has allowed temporary increases in the number of H-2B visas released, approving an additional 15,000 last year and including language in budget bill earlier this year that added 69,000 H-2B visas to the normal 66,000 for 2018. So far, DHS has allotted only 15,000 of those extra visas, and the agency did not respond to questions about when, or if, the rest would be released. But even if they were all handed out, it would still fall short of the number of qualified applications the Labor Department approved. Homeland Security Secretary Kirstjen Nielsen said Congress needs to find a permanent solution to the problem. Brooks was lucky – he got the visa allotment he asked for this year. While Phillips looks over an empty warehouse, Brooks’ business was humming on a recent visit. Brooks and Phillips say they can’t understand the hesitancy to expand the program. According to the H-2B Workforce Coalition, each H-2B visas supports four or five jobs for Americans, and Brooks said American taxpayers as a whole may be losing out, too. Local and state governments are losing out on tax dollars as well. Phillips describes a recent visit from his accountant. “For the first time in 25 years, she told me that I didn’t have to pay quarterly tax because my business has done nothing,” Phillips said. “Just think of the tax dollars these people would be bringing into the country. I mean, a whole bundle of money!